This special short tour is for all travelers who have very limited time, but still want to see the 2 biggest touristic highlights of Peru! Day 3: Aguas Calientes to Machu Picchu and back to Ollantaytambo and Cusco. Arrive in Cusco and transfer to your hotel in the historical center, at walking distance from Plaza de Armas. Today you have time to explore this impressive historic city and/ or to relax and enjoy a good coffee. One night with breakfast in a 3* hotel in the center of Cusco. 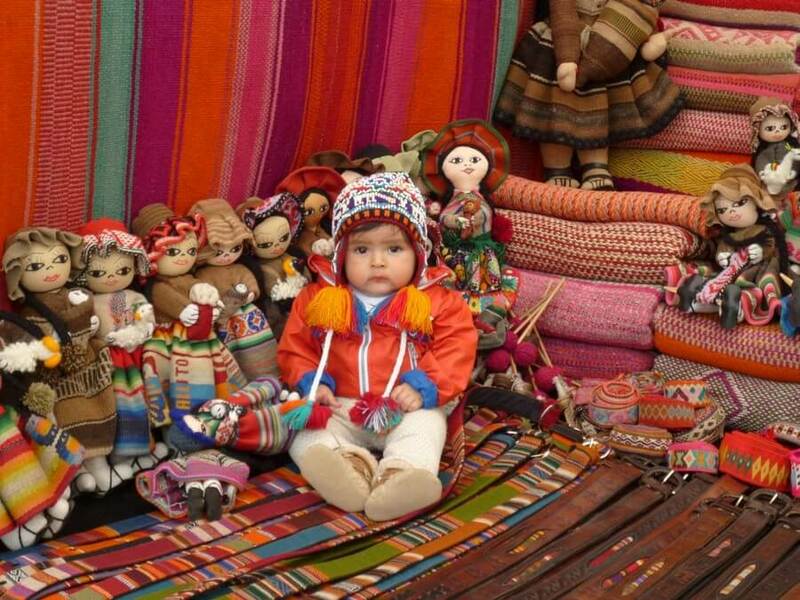 This full day tour takes you to all the most famous and popular parts of the Sacred Valley. 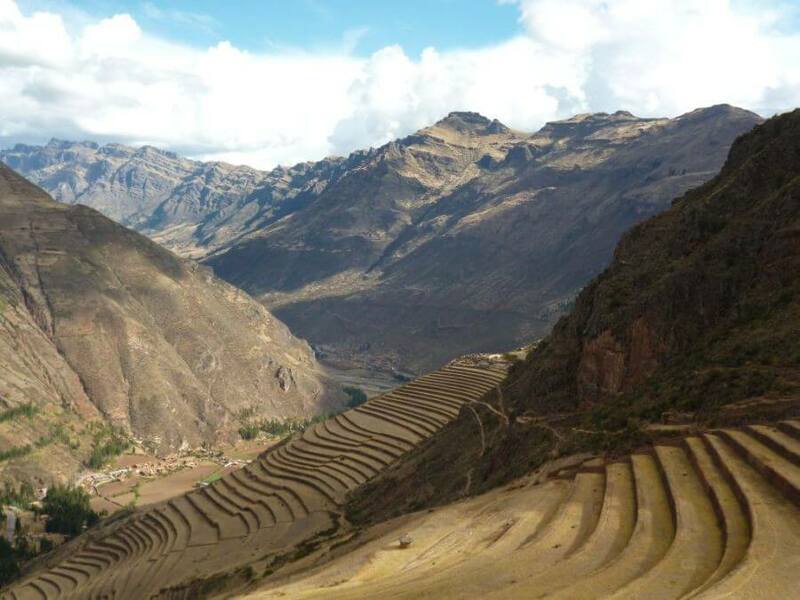 This is a fully guided tour with an English speaking guide who will provide detailed explanations of the surrounding towns and sights in the Sacred Valley. You will be picked up from your hotel at approximately 7:30 am and drive in about 60 minutes to the archeological site of Pisac. Passing along the ruins and enjoying the great views over the valley your guide will explain you part of the impressive Inca history! You will have approximately 30 minutes to visit the market, so make sure you bring some extra cash to get the perfect gift and then it is time to drive to the ancient old salt pans from Salineras. 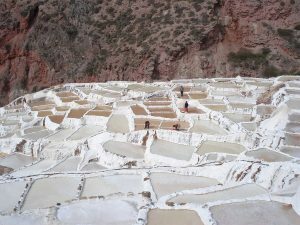 Already for thousands of years the pre-Inca Maras civilization creates small pools on the slopes of the valley to be able to extract the salt from the water that comes out of the mountain. After we’ve taken surrealistic pictures from this unique location, we drive back to Urubamba for lunch. Optional: A complete buffet Lunch in Urubamba (42 soles or US$15 additional), or bring a lunch package. After lunch the journey continues along the valley to the town and ruins of Ollantaytambo. 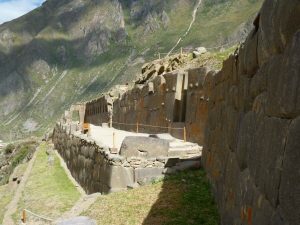 Founded by the Inca Ollanta on the banks of the Urubamba River, Ollantaytambo is a fort built into the mountain with Andean terraces and also a traditional town. At the top of the ruins we find the Sun Temple, constructed of large blocks that have remained intact for centuries in spite of the effects of time and weather. From Ollantaytambo you will take the early evening train to Aguas Calientes (1h45 min.). After arriving in Aguas Calientes, now officially named Machu Picchu Pueblo, the receptionist will pick you up from the train station and bring you to your hotel. Overnight + breakfast in your Hotel in Aguas Calientes. 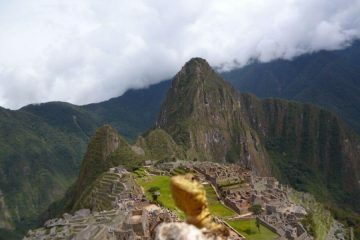 In the morning you can take the bus to Machu Picchu (20 min.) as early as 5:30 am. 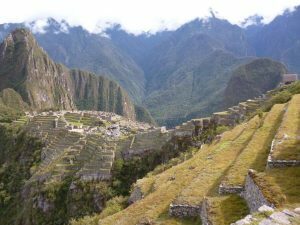 If you have purchased a pass for Huayna Picchu or Machu Picchu mountain you will have the opportunity to climb one of these mountains (note: to be booked far in advance). When you return to Aguas Calientes, you will have to be at the train station 30 minutes before your return train departs towards Ollantaytambo. From there you travel in shared tourist transport back to Cusco. Overnight with breakfast in your hotel in Cusco. 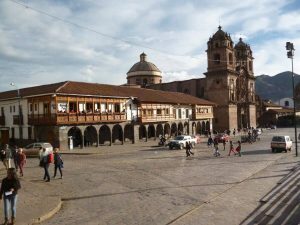 After breakfast a private transfer will bring you from your hotel to the airport in Cusco. Your flight to Puerto Maldonado is exclusive in this tour, but if you want we can also arrange this. Or you can decide to go by overnight bus (10 hours). After a 50 minutes flight you will arrive at the airport of Puerto Maldonado, where your guide will be waiting for you. He/ she will take you to our office located approximately 5 minutes from the airport in the city of Puerto Maldonado. Here we will register and make some last minute shopping for things we might have forgot such as batteries or raingear. Afterwards we will take an unpaved road to Puerto Nuevo, our port in the Infierno Community, for about one hour. 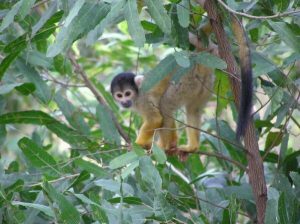 On our journey we can see various types of woodland, traditional banana and citrus plantations, cattle ranches and small creeks. Once in Puerto Nuevo we will embark on our one and a half hour boat trip up the mighty Tambopata. During the boat ride we will also have lunch consisting of delicious vegetarian Arroz Chaufa wrapped in the leaf of the bijao heliconia. There will also be fruit, crackers and a bottle of water. Once we arrive at INOTAWA the manager will receive us and your guide will tell about the do’s and don’ts in the jungle in order for you to enjoy your stay to the maximum. He will also lead you around the installations and show you your room. 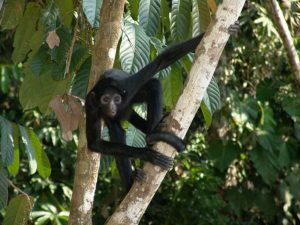 INOTAWA is situated on the bank of the Tambopata river en the Buffer zone of the Tambobata National Reserve and the Bahuaja Sonene National Park. During your journey you can appreciate the banks vegetation consisting mainly of patches of canes, Cecropias and Ficus. 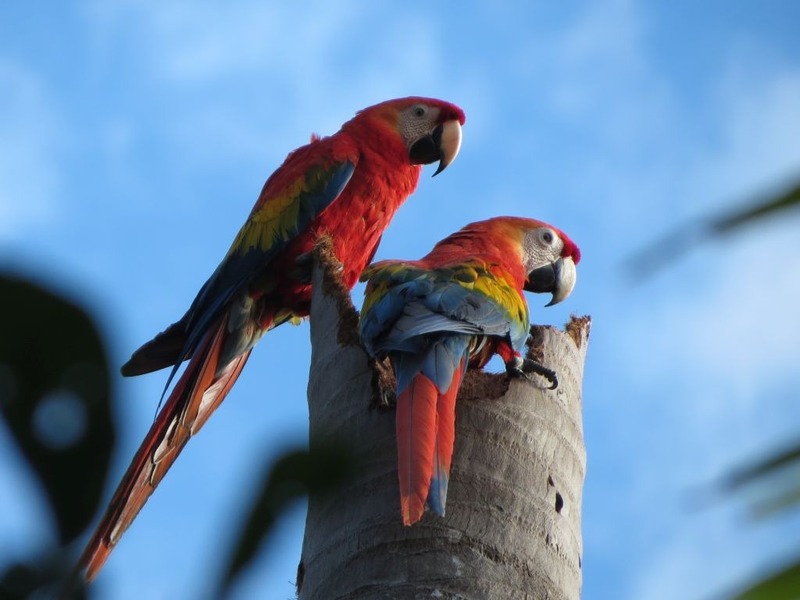 We might also see wildlife such as river birds like the oropendulas and their hanging nesting colonies, egrets, herons and others might fly, toucans or the magnificent macaws. 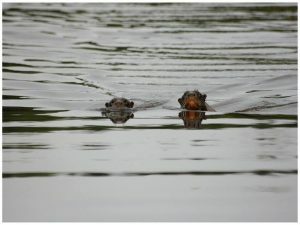 Occasionally we can spot mammals such as capybaras or monkeys or reptilians like spectacle caimans and turtles. In the afternoon we head out into the jungle for a small walk in order to observe the flora such as immense Ironwood or Kapok trees and birds such as Trogons, quails and wild turkeys. Once night falls we can also find spiders such as tarantulas and other nocturnal creatures. After dinner your guide will give you a small speech about what to expect and explain the various activities during your stay. 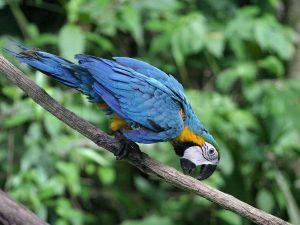 We leave the lodge very early on the morning to go fifteen minutes upriver in order to observe the activity of the macaws, parrots, parakeets and the occasional mammal feeding on the earth. 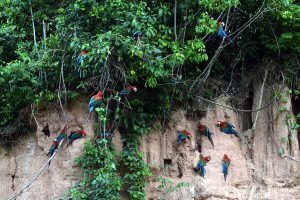 La Torre Clay Lick is a mud bank about four meters high and twenty meters wide crisscrossed with veins of mineral rich clay essential to the diet of these animals. The phenomenon last two to three hours during which we need to stick to the rules and guidelines set by our guide the previous evening. Returning to the lodge we will have breakfast and after a short rest head for Tres Chimbadas Lake. The entrance of the lake is located fifteen minutes downriver from INOTAWA. We then walk about 45 minutes to the lake located deep in the jungle. We will pass an eco-tourism concession held by the native people of the Infierno community. They guard and maintain the area thanks also to the income generated by entry fees from tourists. At the lake itself we will board a traditional catamaran with a single oar in order to move around on the lake following the route indicated by our guide. We can see luscious vegetation and birds such as snakebirds, herons, kingfishers etc. We might also find reptiles and mammals, above all the illusive giant river otter. The lake happens to be the territory of a clan that can frequently be spotted. It’s also possible to practice catch and release fishing and maybe catch a piranha. Once back at the lodge lunch is served and after some rest we leave for an excursion to a local farm. In this area traditional agriculture is practiced. We will visit Don Aurelio and his family. This is a great opportunity to see harvest and try various exotic fruits from the Amazon such as copazú, arazá, pijuayo, yucca, and pineapple. There are also various herbs such as pallilo and false cilantro as well as a range of medicinal plants such as piñón, caña caña and piri piri that are traditionally and widely used by the local people. The program from today is organized in cooperation with the La Torre community. They have traditionally used this area to provide for themselves a sustainable way of life. Here they find materials to build their huts, implements for handicrafts and medicinal plants used to cure diseases. 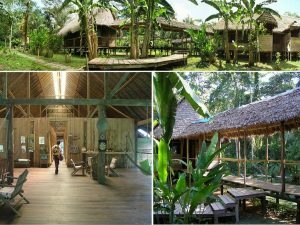 In the last few years they also started to use the area to generate a sustainable income whilst maintaining the environment with the help of eco-tourism. After breakfast we will head for the La Torre Lakes. We will take the boat for about fifteen minutes upriver. 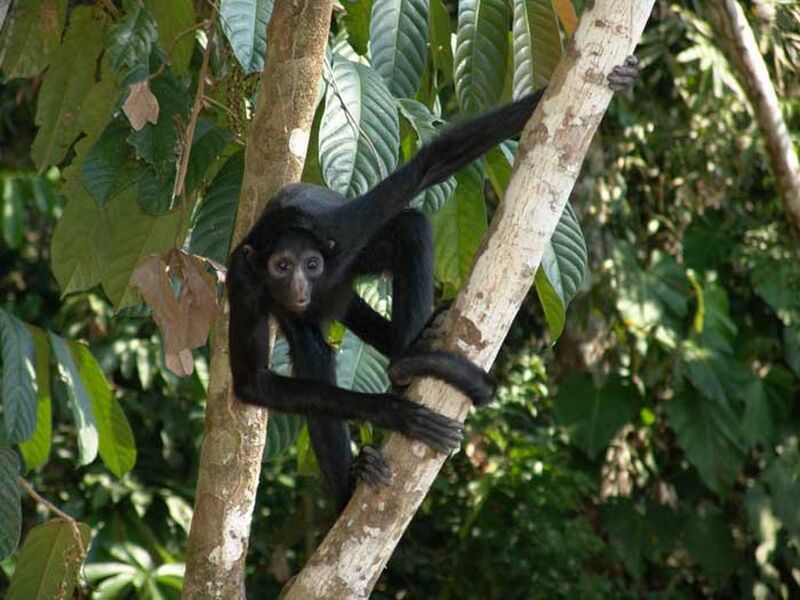 The geographical characteristics with elevations, lakes and mammal clay licks plus the location deep inside the Tambopata National Reserve are the main reasons for the sites exceptional biodiversity. We disembark at the La Torre Park rangers post and continue by foot. We cross a small creek and continue into the jungle to eventually get to the lakes Montes, Pato and Lagarto. The trek will take between four and five hours. Every step it turns more interesting as our guide tells us about the surrounding plants and their practical and medicinal uses and preparation. We will eventually get to a mammal clay lick deep inside the rainforest called Solitaria clay lick. It’s the last of a number of clay licks coming from the south and we can frequently spot peccaries, brocket deer and sometimes even tapirs. Back at the lodge we will have lunch and have the afternoon to relax, go for a swim or catch up on our reading in the hammocks. 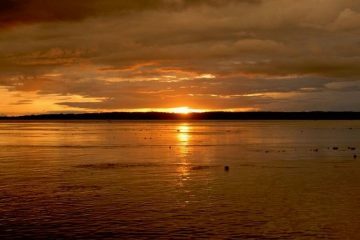 At night we head out in the boat to enjoy ourselves and the sounds of the Amazonian night, we might see a thunderstorm spilling out on the horizon or marvel at constellations like the Southern Cross or Scorpion. 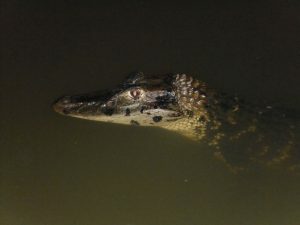 We are also carrying a powerful searchlight in case we come across some nocturnal animals such Amazon tour, Tambopata, Peruas caimans, bats, nightjars or capybaras on the banks and meanders of the Tambopata River. Afterwards dinner will be served. After an early breakfast we will return to the INOTAWA office in Puerto Maldonado and then on to the airport. Your guide will accompany you until the airport and help you with the check-in process for your flight back to Cusco or Lima. Note: the final tour itinerary in the Amazon can be slightly different as written above, depending on un-predictable (weather) circumstances. To climb the Huayna Picchu (US$15) or Machu Picchu Mountain (US$15) to be booked far in advance! – Certificate of Yellow Fever Vaccine! – Sandals or alternative footwear for use at the lodge.